In reading the responses to George Lee’s departure from the Dáil I saw this prompt endorsement of the party leader from Gay Mitchell. It would seem Gay is interested in nailing down his position on this matter very early on. It would be a shame if Jim O’Leary was to be gazumped yet again. But there might be no choice this time. FG have to aim for a minimum of 30% or even better 35% of the first preference vote to avoid Alex White getting elected on FF/general anti-FG transfers. Right now, Alex White is better placed to win over the considerable amount of floating voters in Dublin South, while FG will still start with a larger core party support. The election if it happened of Gay Mitchell would most likely mean the elevation of cllr Naoise O’Muiri to the MEP slot (not a lot of people noticed that) and an opening on the city council in Clontarf, I can just feel the jockeying there already. Of course I could be entirely wrong about this and Shay Brennan will surprise us all and romp home.. This entry was posted in irish politics, Uncategorized and tagged Alex White, Dáil Éireann, dublin south, fine gael, Gay Mitchell, george lee, politics. Bookmark the permalink. 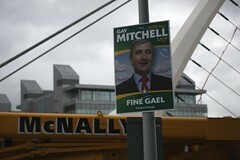 I doubt Gay will return for Dublin South, especially when he’s from Dublin South Central! Dublin Mayor elections is where I see him going. The co-option for clontarf is a young fine gael man as far as I know. Jim O’Leary has a masters in economics. I think he can take the by-election if he can communicate well. I still reckon it is interesting that Gay was out so quickly with a comment on it. I know there is one if not more than one YFG interested in that Clontarf seat if it becomes vacant but it is the membership that will decide the nominee and there are a few stalwarts who know the lie of the land and have put plenty of hours doing the hard graft that is needed.